This book is designed to provide paraprofessionals with the information needed to work effectively as speech-language pathology assistants. The book includes information about a variety of speech, language, and hearing disorders. Information about bilingualism is also included. 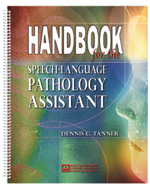 The Handbook for the Speech Language Pathology Assistant is designed to be easy to read and understand.